“When the history of our civilization is written,” wrote H. G. Wells, “it will be a biological history – and Margaret Sanger will be its heroine.” Hearing her tale for themselves, most modern women would find it difficult to disagree with Wells’ conclusion. She instigated the American Birth control movement, named her newspaper The Woman Rebel, and endured a 50-year crusade to convince the world that contraception was a basic human right. 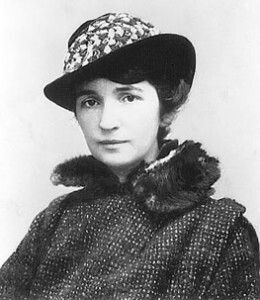 Throughout her half-century of struggle, Sanger endured constant legal harassment, prison, exile and the proclamations of political and religious leaders who denounced her as a ‘murderer’. Nevertheless, she relentlessly challenged the government, church, doctors, the press, public opinion, and even her fellow social reformists in her efforts to convince the world of the need for these most radical and liberating changes. So let us here celebrate the struggle of this World Heroine who died forty-eight years ago today at the age of 86. Sanger’s battle began in earnest in 1912 whilst working as a maternity nurse in New York City’s impoverished Lower East Side. Having already observed her own mother’s slow and painful death at the age of forty-eight, her body ruined after eighteen pregnancies, Sanger witnessed multitudes of similarly worn-out women plunged into panic and despair at the thought of a fifth or sixth pregnancy. Many resorted to self-induced abortions, often leading to death; some even chose suicide. Sanger concluded that the only way to end such perpetual misery was through the introduction of birth control. But with no one from her socialist circle willing to help champion such a radical social problem, Sanger felt compelled to act alone. We are barbarians, only barely civilised, and the veneer of civilisation is thin, indeed. Thanks for the reminder, and the inspiration. September 2013 and girls and women are still treated barbarically around the world. The plight of women in the Middle East, Africa, South America and New Guinea for instance who are subjected to irrelevant and cruel religious, social and moral practices would be glad to have the likes of Margaret Sanger in their corner. We still have a long way to go and change can be excruciatingly slow. Thank you to the real men who support and protect their sisters. Such an important reminder, particularly to those of us in the United States as we consider whom to elect President in November. Some still wish to see women as second class citizens! @ Dwayne.. Whilst abortion may indeed be one method of population control that has been used against ethnic groups in the past, its pretty safe to assume that toady, those elitist groups that you mention with vast nuclear arsenals at their disposable, probably consider it a bit light weight and unless your a member, how will you ever know for sure?.. So despise the elites but keep your mind open and don’t let it blind you to the plight of your sisters or those who stand for freedom.